Be AWARE & SHARE if you CARE !!!!! VERY IMPORTANT !!!!!! I just had a SCAM call from the following numbers in Sydney 0280051898 / 0280914070 pretending to be Telstra/Optus Tech Support, warning me that my PC has been hacked into while they were trying to get me to give them access (to Hack it). Although this may not be directly related to LinkedIn or Social Media, but we definitely need all the support we can get to warn everyone in our networks using Social Media. This was a very obvious scam that I wanted to share with everyone in Australia and all over the world, if you get a call from such numbers or with such instructions be aware. They will tell you that your computer has been hacked into and ask you to download a remote access software such as "TeamViewer" so that they may access your pc (Hack into it), they will claim that they are from Optus or Telstra Tech support and threat you that they will disconnect your internet service if you dont get the hacking removed as it could impact the entire internet network in Australia (yea right). It is very obvious that they are far from professional from the way they talk, optus/telstra wouldn't hire such people. They are calling random numbers and have no idea who they are speaking to (as in wouldn't say can I speak to Mr. X), they don't know your internet UserID, if in doubt hang up and call your ISP Support directly. I went along with them to see how far they want to go, they asked me to downloading the teamviewer (remote access software) they asked me for the ID and password showing on the software claiming they wanted to verify them, I asked them to give me the numbers and i would verify them (playing along) they said "sorry we sent the number on your screen and we want to verify them before we proceed (as if). Is it true that Linkdin initially gives up to 3000 invitation requests and that they put some restrictions on the invitations sent after that ?? Why are you using LinkedIn? What are the benefits of using LinkedIn? What have you gained by using it so far? This is an interesting question that I have posted on LinkedIn back in APR-2011 where I have received 52 Answers for. I am preparing a presentation for a networking event in Jeddah about Networking & LinkedIn. - To find experts and get advices. - To stay updated with the latest news especially about your network and whats new. Reopening the question again as the reasons and benefits are almost endless .. This time planning to run a seminar in CAIRO. Below are some very useful & tiny (EZy 2 remember) links that will take you to some advanced searches of LinkedIn Members in different areas and regions. You can simply modify the selection criteria from the left side by adding keywords, selecting companies or industries, modifying countries selected,...etc. Thanks for being one of my best LinkedIn mentors, if it wasnt for leaders like you, I wouldn't have been able to catch up with you. I have been looking forward to catching up with you for a long time, thanks for setting up an example for me to be #1 in the Middle East. View more presentations from Ehab Elagaty. Search on Google for job websites in your country or region. Sign up for auto notifications of searches for the types of jobs you are looking for. Update your LinkedIn profile with all your Positions / Qualifications / Skills / What you are looking for. Search for and Join the largest Groups on LinkedIn using keywords like Job, Jobs, SAP, IT, Sales, Middle East, Saudi Arabia, Australia. Search for Jobs inside the groups by using keywords in discussions and under the jobs tab. Search for Jobs under LinkedIn Jobs as some Employers / Recruiters post there. Search for, contact with the Top Most Connected Recruiters / Managers / Professionals in your field (using the advance search, then sort by number of connections). Post your availability and what types of jobs you are looking for on the Groups. Post questions from time to time to your network through Q&A / Discussions / Jobs tab asking if they know of any jobs in your field / area / region or if they have any other tips. Link your Twitter account with your LinkedIn account from Edit Profile so network activities can be posted their too. Search for Jobs / Recruiters on Twitter.com as well and follow job posters. Scan through ads online and print and send your CV across even if the advertised role is not a relevant to you, they may have an unadvertised relevant role for you now or a relevant one later on. Update your headline, summary to mention that you are looking for work and what type. Expand your network with the most connected LIONs ("LinkedIn Open Networkers" if you like the idea of being an open networker) globally and in your country, area of interest. Invite your friends / colleagues / ... more details at the post "LinkedIn & How to rapidly expand your network" on Linked Fans. Ask for recommendations from those that would be willing to recommend you, start by recommending the ones that deserve recommendations (feel free to recommend me if you find my tips useful www.elagaty.com/recommendehab ). Search for the Most Connected Recruiters and Managers in the Companies and Areas that you would like to work in. Last but not least. Try to help others and give charity as Allah (GOD, if you believe in Him) is always in the help of those that help. Along with praying, be good to your parents and ask for their prayers as their prayers can do miracles. Forward this to any of your friends who may find this useful. Dig the well before you get thirstly. Sorting by Connections through Advanced Search is a very useful feature that can be utilized in LinkedIn to get a list of the top 10-100 most connected people in a particular country, region, group of countries, industry, groups, professions, …etc. Such searches can make it easier to target getting in touch with or connecting with the Top Most Connected people in a particular country or industry. You can filter further your lists by selecting further selection criteria. Feel free to Bookmark / Share / Forward this page should you find it useful, or contribute with your comments. Keep an eye on www.LinkedFans.blogspot.com for more valuable tips to come. One of the most important tips that I was given to expand my network rapidly when I first started using LinkedIn back in Mid 2005 was to Search for then connect with the most connected people (especially the LIONs / Open Networkers / TopLinked members) in my country, area of specialty or interest. So I wanted to share this important tip with you along with some links as examples for searching for most connected people / TopLinked/Open Networkers / SAP specialists in the Middle East / Saudi Arabia / Egypt / Australia / Worldwide. Post a comment if you are keen to receive more tips here. 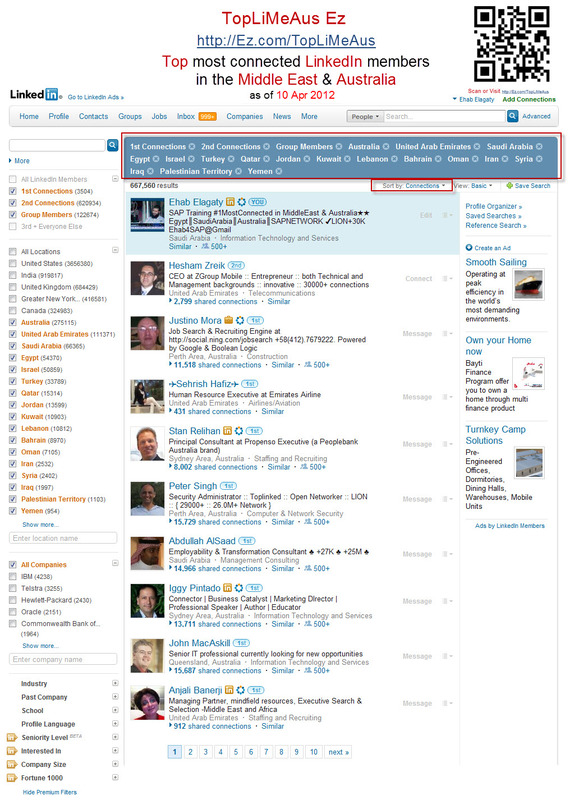 All searches are done using Advanced Search and are Sorted by Number of Connections. > Know they would welcome your invitation (and would not click on the "I don't know this person" button) as this could go against you and prevent you from adding friends and colleagues without typing in their email addresses. It is quit safe to search for members in groups like LION / Open Networkers / TopLinked or to search for such keywords, just be aware that the keyword LION which stands for "Open LinkedIn Networker" may show up members that have words like milLION as part of their profiles or the animal lion. www.linkedfans.net. Simple theme. Powered by Blogger.